What does Warping means ? The purpose of warping is to arrange threads in long parallel lengths. In the primary operation of warping, ends withdrawn from of warping creel, evenly spaced in sheet form are wounded on to a beam (known as a warper beam) to a substantial length. Sectional beam warping allows whole warp yarns, constituting a section, to be obtained on the drum. Then an operation will allow warps yarns to be transfer from the drum to the warp beam while preserving constant tension. 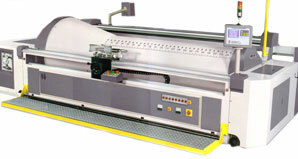 In this operation, amount of many colored yarns can involved to get better fabric design. The Simple and Robust Construction of Separate Warping & beaming for Vibration free Performance Ever. 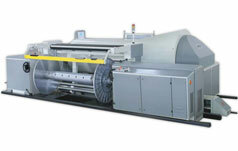 Most Advanced Separate Warping & Beaming System. 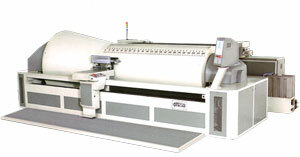 Automatic Measuring System of Feedrate without any Calculating Parameters. Constant Tension by the Modernized Electronic system throughout Beaming. Constant Warping & Beaming Speed. Actual Length Measurement While Warping & Beaming. Advantage of Auto Section Setting. Safety Device Equipped with Optical Sensing and Instant stopping. Data Pring Out Facility. (Optional). Three Servo Systems for Traverse Pitch Control. High Tech Bail Screw with Nut for all Servo Systems for Zero Back Less and Very Precise Positioning. Drum Vacillation through Ball Screw. Carriage Slides Back by Servo Motor & Controller on Linear Motion Bearings. Very Precise Three-roll Carriage with Press Back Evener Roller. Auto Section Controlling Through PLC.